A painter path is an object composed of a number of graphical building blocks, such as rectangles, ellipses, lines, and curves. Building blocks can be joined in closed subpaths, for example as a rectangle or an ellipse. A closed path has coinciding start and end points. Or they can exist independently as unclosed subpaths, such as lines and curves. 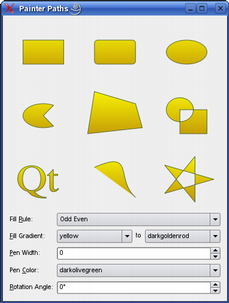 A QPainterPath object can be used for filling, outlining, and clipping. To generate fillable outlines for a given painter path, use the QPainterPathStroker class. The main advantage of painter paths over normal drawing operations is that complex shapes only need to be created once; then they can be drawn many times using only calls to the QPainter::drawPath() function. QPainterPath provides a collection of functions that can be used to obtain information about the path and its elements. In addition it is possible to reverse the order of the elements using the toReversed() function. There are also several functions to convert this painter path object into a polygon representation. A QPainterPath object can be constructed as an empty path, with a given start point, or as a copy of another QPainterPath object. Once created, lines and curves can be added to the path using the lineTo(), arcTo(), cubicTo() and quadTo() functions. The lines and curves stretch from the currentPosition() to the position passed as argument. The currentPosition() of the QPainterPath object is always the end position of the last subpath that was added (or the initial start point). Use the moveTo() function to move the currentPosition() without adding a component. The moveTo() function implicitly starts a new subpath, and closes the previous one. Another way of starting a new subpath is to call the closeSubpath() function which closes the current path by adding a line from the currentPosition() back to the path's start position. Note that the new path will have (0, 0) as its initial currentPosition(). QPainterPath class also provides several convenience functions to add closed subpaths to a painter path: addEllipse(), addPath(), addRect(), addRegion() and addText(). The addPolygon() function adds an unclosed subpath. In fact, these functions are all collections of moveTo(), lineTo() and cubicTo() operations. In addition, a path can be added to the current path using the connectPath() function. But note that this function will connect the last element of the current path to the first element of given one by adding a line. See the Qt::FillRule documentation for the definition of the rules. A painter path's currently set fill rule can be retrieved using the fillRule() function, and altered using the setFillRule() function. The QPainterPath class provides a collection of functions that returns information about the path and its elements. The currentPosition() function returns the end point of the last subpath that was added (or the initial start point). The elementAt() function can be used to retrieve the various subpath elements, the number of elements can be retrieved using the elementCount() function, and the isEmpty() function tells whether this QPainterPath object contains any elements at all. The controlPointRect() function returns the rectangle containing all the points and control points in this path. This function is significantly faster to compute than the exact boundingRect() which returns the bounding rectangle of this painter path with floating point precision. Finally, QPainterPath provides the contains() function which can be used to determine whether a given point or rectangle is inside the path, and the intersects() function which determines if any of the points inside a given rectangle also are inside this path. For compatibility reasons, it might be required to simplify the representation of a painter path: QPainterPath provides the toFillPolygon(), toFillPolygons() and toSubpathPolygons() functions which convert the painter path into a polygon. The toFillPolygon() returns the painter path as one single polygon, while the two latter functions return a list of polygons. The toFillPolygons() and toSubpathPolygons() functions are provided because it is usually faster to draw several small polygons than to draw one large polygon, even though the total number of points drawn is the same. The difference between the two is the number of polygons they return: The toSubpathPolygons() creates one polygon for each subpath regardless of intersecting subpaths (i.e. overlapping bounding rectangles), while the toFillPolygons() functions creates only one polygon for overlapping subpaths. The toFillPolygon() and toFillPolygons() functions first convert all the subpaths to polygons, then uses a rewinding technique to make sure that overlapping subpaths can be filled using the correct fill rule. Note that rewinding inserts additional lines in the polygon so the outline of the fill polygon does not match the outline of the path. Qt provides the Painter Paths Example and the Vector Deformation Demo which are located in Qt's example and demo directories respectively. The Painter Paths Example shows how painter paths can be used to build complex shapes for rendering and lets the user experiment with the filling and stroking. 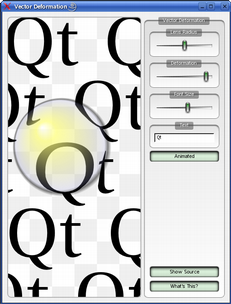 The Vector Deformation Demo shows how to use QPainterPath to draw text. See also QPainterPathStroker, QPainter, QRegion, and Painter Paths Example. This enum describes the types of elements used to connect vertices in subpaths. Note that elements added as closed subpaths using the addEllipse(), addPath(), addPolygon(), addRect(), addRegion() and addText() convenience functions, is actually added to the path as a collection of separate elements using the moveTo(), lineTo() and cubicTo() functions. QPainterPath::MoveToElement 0 A new subpath. See also moveTo(). QPainterPath::LineToElement 1 A line. See also lineTo(). QPainterPath::CurveToElement 2 A curve. See also cubicTo() and quadTo(). QPainterPath::CurveToDataElement 3 The extra data required to describe a curve in a CurveToElement element. See also elementAt() and elementCount(). Constructs an empty QPainterPath object. Creates a QPainterPath object with the given startPoint as its current position. Creates a QPainterPath object that is a copy of the given path. Creates an ellipse within the the specified boundingRectangle and adds it to the painter path as a closed subpath. See also arcTo(), QPainter::drawEllipse(), and Composing a QPainterPath. Creates an ellipse within the bounding rectangle defined by its top-left corner at (x, y), width and height, and adds it to the painter path as a closed subpath. Adds the given path to this path as a closed subpath. See also connectPath() and Composing a QPainterPath. Adds the given polygon to the path as an (unclosed) subpath. Note that the current position after the polygon has been added, is the last point in polygon. To draw a line back to the first point, use the closeSubpath() function. See also lineTo() and Composing a QPainterPath. Adds the given rectangle to this path as a closed subpath. The rectangle is added as a clockwise set of lines. The painter path's current position after the rectangle has been added is at the top-left corner of the rectangle. See also addRegion(), lineTo(), and Composing a QPainterPath. Adds a rectangle at position (x, y), with the given width and height, as a closed subpath. Adds the given region to the path by adding each rectangle in the region as a separate closed subpath. See also addRect() and Composing a QPainterPath. Adds a rectangle r with rounded corners to the path. The xRnd and yRnd arguments specify how rounded the corners should be. 0 is angled corners, 99 is maximum roundedness. A filled rectangle has a size of r.size(). A stroked rectangle has a size of r.size() plus the pen width. See also addRect() and QPen. Adds a rounded rectangle, rect, to the path. The roundness argument specifies uniform roundness for the rectangle. Vertical and horizontal roundness factors will be adjusted accordingly to act uniformly around both axes. Use this method if you want a rectangle equally rounded across both the X and Y axis. Adds a rectangle with rounded corners to the path. The rectangle is constructed from x, y, and the width and height w and h.
Adds a rounded rectangle to the path, defined by the coordinates x and y with the specified width and height. Adds the given text to this path as a set of closed subpaths created from the font supplied. The subpaths are positioned so that the left end of the text's baseline lies at the specified point. See also QPainter::drawText() and Composing a QPainterPath. Adds the given text to this path as a set of closed subpaths created from the font supplied. The subpaths are positioned so that the left end of the text's baseline lies at the point specified by (x, y). Returns the angle perpendicular to the slope of the path at the percentage t. The angle is constructed with the reference frame of the horizontal (x) axis and the left side of the path (left as defined by the direction of the path). The argument t has to be between 0 and 1. Note that similarly to the other percent methods, the percentage measurment is not linear with regards to the length if curves are present in the path. When curves are present the percentage argument is mapped to the t parameter of the Bezier equations. Creates a move to that lies on the arc that occupies the given rectangle at angle. Angles are specified in degrees. Clockwise arcs can be specified using negative angles. See also moveTo() and arcTo(). 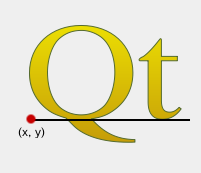 Creates a move to that lies on the arc that occupies the QRectF(x, y, width, height) at angle. Creates an arc that occupies the given rectangle, beginning at the specified startAngle and extending sweepLength degrees counter-clockwise. Note that this function connects the starting point of the arc to the current position if they are not already connected. After the arc has been added, the current position is the last point in arc. To draw a line back to the first point, use the closeSubpath() function. See also arcMoveTo(), addEllipse(), QPainter::drawArc(), QPainter::drawPie(), and Composing a QPainterPath. 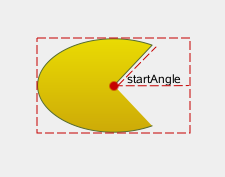 Creates an arc that occupies the rectangle QRectF(x, y, width, height), beginning at the specified startAngle and extending sweepLength degrees counter-clockwise. Returns the bounding rectangle of this painter path as a rectangle with floating point precision. Closes the current subpath by drawing a line to the beginning of the subpath, automatically starting a new path. The current point of the new path is (0, 0). If the subpath does not contain any elements, this function does nothing. See also moveTo() and Composing a QPainterPath. Connects the given path to this path by adding a line from the last element of this path to the first element of the given path. See also addPath() and Composing a QPainterPath. Returns true if the given point is inside the path, otherwise returns false. Returns true if the given path p is contained within the current path. Returns true if the given rectangle is inside the path, otherwise returns false. Returns the rectangle containing all the points and control points in this path. This function is significantly faster to compute than the exact boundingRect(), and the returned rectangle is always a superset of the rectangle returned by boundingRect(). Adds a cubic Bezier curve between the current position and the given endPoint using the control points specified by c1, and c2. After the curve is added, the current position is updated to be at the end point of the curve. See also quadTo() and Composing a QPainterPath. Adds a cubic Bezier curve between the current position and the end point (endPointX, endPointY) with control points specified by (c1X, c1Y) and (c2X, c2Y). Returns the current position of the path. Returns the element at the given index in the painter path. See also ElementType, elementCount(), and isEmpty(). Returns the number of path elements in the painter path. See also ElementType, elementAt(), and isEmpty(). Returns the painter path's currently set fill rule. Returns a path which is the intersection of this path and p.
Returns true if any point in the given rectangle intersects the path; otherwise returns false. There is an intersection if any of the lines making up the rectangle crosses a part of the path or if any part of the rectangle overlaps with any area enclosed by the path. This function respects the current fillRule to determine what is considered inside the path. Returns true if the current path intersects at any point the given path p. The intersection will return false if the path is fully contained within this path (use contains() to check for that case). Returns true if there are no elements in this path, otherwise returns false. Returns the length of the current path. Adds a straight line from the current position to the given endPoint. After the line is drawn, the current position is updated to be at the end point of the line. See also addPolygon(), addRect(), and Composing a QPainterPath. Moves the current point to the given point, implicitly starting a new subpath and closing the previous one. See also closeSubpath() and Composing a QPainterPath. Moves the current position to (x, y) and starts a new subpath, implicitly closing the previous path. Returns percentage of the whole path at the specified length len. Note that similarly to other percent methods, the percentage measurment is not linear with regards to the length, if curves are present in the path. When curves are present the percentage argument is mapped to the t parameter of the Bezier equations. Returns the point at at the percentage t of the current path. The argument t has to be between 0 and 1. 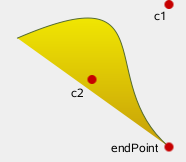 Adds a quadratic Bezier curve between the current position and the given endPoint with the control point specified by c.
After the curve is added, the current point is updated to be at the end point of the curve. See also cubicTo() and Composing a QPainterPath. Adds a quadratic Bezier curve between the current point and the endpoint (endPointX, endPointY) with the control point specified by (cx, cy). Sets the x and y coordinate of the element at index index to x and y. Returns the slope of the path at the percentage t. The argument t has to be between 0 and 1. Returns a path which is p subtracted from this path. Returns a path which is this path subtracted from p.
Converts the path into a polygon using the QTransform matrix, and returns the polygon. The polygon is created by first converting all subpaths to polygons, then using a rewinding technique to make sure that overlapping subpaths can be filled using the correct fill rule. Note that rewinding inserts addition lines in the polygon so the outline of the fill polygon does not match the outline of the path. See also toSubpathPolygons(), toFillPolygons(), and QPainterPath Conversion. Converts the path into a list of polygons using the QTransform matrix, and returns the list. 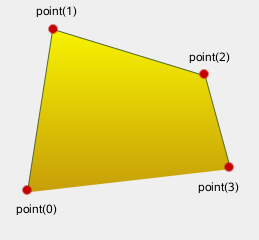 The function differs from the toFillPolygon() function in that it creates several polygons. It is provided because it is usually faster to draw several small polygons than to draw one large polygon, even though the total number of points drawn is the same. The toFillPolygons() function differs from the toSubpathPolygons() function in that it create only polygon for subpaths that have overlapping bounding rectangles. Like the toFillPolygon() function, this function uses a rewinding technique to make sure that overlapping subpaths can be filled using the correct fill rule. Note that rewinding inserts addition lines in the polygons so the outline of the fill polygon does not match the outline of the path. See also toSubpathPolygons(), toFillPolygon(), and QPainterPath Conversion. Creates and returns a reversed copy of the path. It is the order of the elements that is reversed: If a QPainterPath is composed by calling the moveTo(), lineTo() and cubicTo() functions in the specified order, the reversed copy is composed by calling cubicTo(), lineTo() and moveTo(). This function creates one polygon for each subpath regardless of intersecting subpaths (i.e. overlapping bounding rectangles). To make sure that such overlapping subpaths are filled correctly, use the toFillPolygons() function instead. 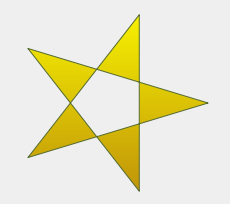 See also toFillPolygons(), toFillPolygon(), and QPainterPath Conversion. Returns a path which is the union of this path and p.
See also intersected(), subtracted(), and subtractedInverted(). Returns true if this painter path differs from the given path. Note that comparing paths may involve a per element comparison which can be slow for complex paths. Assigns the given path to this painter path. Returns true if this painterpath is equal to the given path. Writes the given painter path to the given stream, and returns a reference to the stream. Reads a painter path from the given stream into the specified path, and returns a reference to the stream.